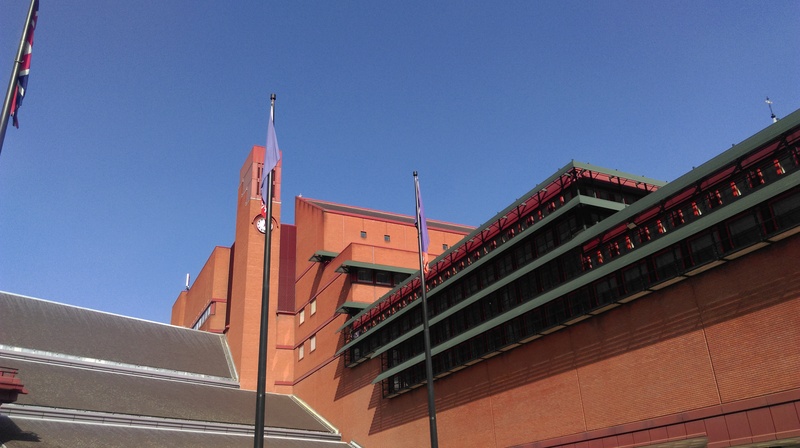 The past weekend was full of firsts for me – I was on the panel for one of the seminars at this year’s International Translation Day conference at the British Library; I attended the ITI German Network’s annual workshop and social weekend for the first time, and in the course of it, I participated in a translation slam for the first time. Having got out my irritation at comments from the opening session at this year’s International Translation Day conference, I was intending to write up the rest of the day. Kristen Gehrman has saved me the bother, however – you can read her excellent notes here. So instead, I’ll write a little about the rest of the weekend. Takes something special to be indoors on a day like this! … make it clear right from the start that as the translator I retain copyright over the translation and thus have the final say over what goes into it. Obviously we both want to get it right, but there has to be a cut-off point somewhere if it comes to haggling over words or beloved phrases. There was also discussion of potential platforms for self-publishing one’s own translations, but the technicalities are rather beyond me. The important thing to note is that you must have the rights cleared, approval from the author or their estate etc. before you can do this. * There was also a note of caution around the fact that conventional publishers might not be willing to pick up books that had previously been self-published, as that might mean they were ineligible for prizes and/or funding. It has happened though – the panel was chaired by Stefan Tobler of And Other Stories, who published Southeaster after it had been self-published in Spain by translator Jon Lindsay Miles. The difference there being that the AOS edition was still its first UK publication. And of course there’s the issue of whether or not you’re prepared to put your name and reputation to the book in question…! Anyway, the seminar was well-attended, and generated a lot of interest and discussion. And as always, there was plenty of coffee, plenty of lunch, and plenty of time to eat, chat and get out into the fabulous sunshine. The day was rounded off by drinks, at which point the low ceiling of the bar area made things almost deafening, and eventually, a small but select group of us made it to the pub for dinner and more discussion of things literary, linguistic and translational. No translator on the opening panel => idiotic remarks per previous post. Milling around space is too small compared to the capacity of the lecture theatre. Apart from that, the conference was as fabulous as ever and here’s to 2016. * For more on this, see this post by fellow panelist Tina Tenneberg. This entry was posted in Translation and tagged And Other Stories, authors, British Library, International Translation Day, ITD15, literature, London, professional development, publishing, self-publishing, translation. Bookmark the permalink. first of all: it was nice to meet you at the translation and self-publishing session last Friday! I am aware of the fact that not all translators are interested in becoming self-publishers including learning the technicalities, the majority might still prefer to work with self-publislihed authors like they would with publishing houses and I think that’s absolutely fine. On the other hand, I believe it can’t hurt to get at least a vague idea of new options. I think it was good that we were talking about two different angles of self-publishing for translators. Thanks, Tina. I’ve corrected the link too.